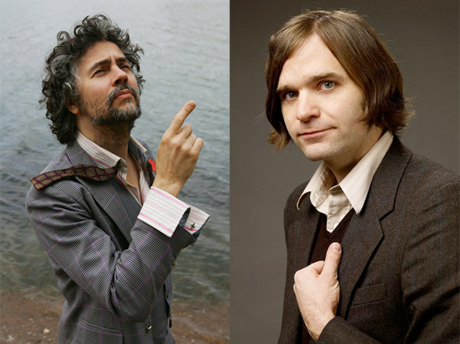 Flaming Lips and Death Cab for Cutie to Collaborate? Oklahoman rock vets the Flaming Lips have been on a collaboration spree this year, having already announced joint ventures with Neon Indian, Lighting Bolt and Deerhoof, among others. It looks as if you can add indie rock sad-sacks Death Cab for Cutie to that list, if you can believe a recent interview with the band that Lips leader Coyne crashed at Montreal's Osheaga festival. Death Cab members Ben Gibbard and Nick Harmer were speaking with Spinner at the recent music fest when Coyne dropped in to the conversation out of nowhere. Explaining that the Lips had already lined up a ton of collaborations and hinting at work with Nick Cave and Prefuse 73, Coyne proceeded to pitch Death Cab the idea of a team-up. "We should find a way to do a Flaming Lips/Death Cab three- or four-song EP," Coyne said. "Do you have any extra junk laying around that you could send to me and I could add stuff to? Even if it's a song you already have out or a different version of it. Don't make it a big deal. If you have something that you could send us..."
While nothing can be confirmed at present, the Death Cab dudes seemed on board with the concept. "I know we have a couple things we were working on when we made this record. But I don't know what state they're in," Gibbard claimed, while Harmer added, "I know there are two songs that were unfinished for the album that are still great. I wouldn't even say they're unfinished." GIbbard went on to hint at the possibility of working on a song called "Aimless Intellectual," as well as something called "American Waltz." Despite the possibility of the heavyweights hooking up, Coyne wanted to make clear that this would just be a small project. "I look at it more like, 'The Flaming Lips featuring...' so it doesn't feel like another group. But I don't really care, I just thought if I asked, you'd say maybe you had some instrumental thing." Despite nothing being set in stone, the bands then apparently exchanged numbers. We'll keep our ears perked for any more info.